Now, on to the seeds! Allium ex ‘Forelock’. Allium, ornamental onion. Seed collected from ‘Forelock’, which has reddish purple, ball-shaped blooms on 4- to 5-foot-tall stems in early summer. Not sure what seedlings will look like. Perennial bulb; Zones 5 to 9. Allium tricoccum. Ramp, wild leek. Flavorful foliage in spring; leaves disappear in early summer; white flowers appear in midsummer to about 8 inches tall. May be slow to germinate. U.S. native (provenance Milford Township, Bucks County, PA). Perennial bulb; Zones 3 to 8. Seed has been stored warm/moist since mid-October. Amaranthus caudatus ‘Dreadlocks’. ‘Dreadlocks’ love-lies-bleeding. Long chains of reddish pink bloom clusters cascading from 3- to 5-foot-tall stems. Annual. Amaranthus ‘Elephant Head’. ‘Elephant Head’ amaranth. Large, tapering, deep red bloom clusters atop 4- to 5-foot-tall stems. Annual. Amaranthus ‘Hopi Red Dye’. ‘Hopi Red Dye’ amaranth. Leaves, stems, and flower plumes are all deep red; 4 to 6 feet tall. Young leaves are edible. Annual. Amsonia hubrichtii. Arkansas bluestar. Clusters of small, pale blue flowers in late spring, yellow/orange fall color; 3 to 4 feet tall. U.S. native. Perennial; Zones 4 to 9. Amsonia rigida. Stiff bluestar. Light blue flowers in late spring; yellow fall color; 18 to 24 inches tall. Parent plants were growing next to A. hubrichtii, so hybrid seedlings are possible. U.S. native. Perennial; Zones 5(?) to 9. Andropogon gerardii. Big bluestem. Warm-season meadow grass with slender, reddish panicles in late summer; coppery red fall color; clump-forming; 5 to 7 feet tall. U.S. native (provenance Milford Township, Bucks County, PA). Perennial; Zones 4 to 9. Andropogon virginicus. Broomsedge. Warm-season meadow grass with tufts of silvery seeds in fall; coppery orange fall color; dried foliage persists through winter; clump-forming; 3 to 5 feet tall. U.S. native (provenance Milford Township, Bucks County, PA). Perennial; Zones 3 to 8. Anemone cylindrica. Thimbleweed. Greenish white flowers in early summer, followed by interesting seedheads for the rest of the growing season; 18 to 24 inches tall. U.S. native. Perennial; Zones 2 to 8. Anthericum ramosum. Graceful, gaura-like sprays of white flowers in midsummer; about 2 feet tall in bloom. Perennial; Zones 5 to 8. Anthriscus sylvestris ‘Ravenswing’. ‘Ravenswing’ cow parsley. Ferny, deep purple-brown foliage; lacy clusters of white flowers in late spring to early summer; to around 3 feet tall in bloom. Self-sows freely. Perennial; Zones 3 to 8. Aster tataricus. Tatarian aster. Clusters of purple flowers atop 6-foot-tall stems in early to mid-fall; spreads by rhizomes to form large patches. Perennial; Zones 3 to 8. Atriplex hortensis var. rubra. Red orach. Entire plant is deep reddish purple (stems, leaves, flower/seedheads); 3 to 6 feet tall. Young leaves are edible. Annual. Baptisia alba. White false indigo. Spiky clusters of white flowers in late spring to early summer; 3 to 4 feet tall. U.S. native. Perennial; Zones 3 to 9. Baptisia ex ‘Purple Smoke’. False indigo. Spiky flower clusters in late spring; 3 to 4 feet tall. Parent plant has light purple flowers but was growing next to yellow ‘Carolina Moonlight’, so seedlings may have various flower colors. Perennial; Zones 3 to 9. Baptisia ex ‘Twilite’. False indigo. Spiky flower clusters in late spring. Parent plant has dusky purple flowers; not sure what colors seedlings may have. Perennial; Zones 3 to 9. Baptisia sphaerocarpa. Yellow false indigo. Spiky clusters of yellow flowers in late spring; about 3 feet tall. U.S. native. Perennial; Zones 3 to 9. Briza maxima. Greater quaking grass. Clump-former with dangling, locket-like, silvery green flowerheads and golden seedheads in summer; 18 to 24 inches tall. Self-sows. Annual. Bouteloua curtipendula. Sideoats grama. Charming, summer-flowering grass well suited to naturalistic plantings; 2 to 3 feet tall. U.S. native. Perennial; Zones 4 to 9. Bupleurum rotundifolium. Hare’s ear, thorough-wax. Euphorbia-like yellow flowers from early to midsummer; 2 to 3 feet tall. Annual. Calamagrostis brachytricha. Korean feather reed grass. Clump-forming, fall-flowering grass; yellow fall foliage color; to about 4 feet tall. Perennial; Zones 4 to 9. Cardiocrinum cordatum. Large, trumpet-shaped flowers in midsummer; about 4 feet tall. Takes several years to reach flowering size from seed, so it requires a lot of patience. Perennial; Zones 5 or 6 to 9 (reportedly hardy down to Zone 3 with heavy snow cover). Celosia spicata ‘Mega Punk’. ‘Mega Punk’ spike celosia. Reddish pink flower spikes and deep red leaves on 2- to 3-foot-tall stems. A seed strain that evolved here at Hayefield, from ‘Punky Red’ and ‘Wine Sparkler’. If saving seed, collect from plants with the darkest foliage. Annual. Cephalanthus occidentalis. Buttonbush. Deciduous shrub with white, ball-shaped blooms in summer; 6 to 12 feet tall. U.S. native. Zones 5 to 9. Cephalaria gigantea. Giant scabious. Soft yellow flowers atop 5- to 7-foot-tall stems in early summer. Perennial; Zones 4 to 9. Cercis canadensis. Eastern redbud. Deciduous, small tree with purplish pink flowers in mid- to late spring and yellow fall color; to about 20 feet tall. U.S. native. Seeds were soaked in boiling water for 1 minute then stored cool/moist since early October. Zones 4 to 8 or 9. Chasmanthium latifolium. Northern sea oats. Clump-forming grass with handsome, flattened, flower- and seedheads in summer and fall; 2 to 3 feet tall. Will self-sow freely. U.S. native. Perennial; Zones 4 to 9. Clematis addisonii. Addison’s leather flower. Purple-and-white bells mostly in early summer; grows from the ground each year to reach 2 to 3 feet tall. U. S. (Virginia) native. Perennial; Zones 5 to 8. Clematis glaucophylla. Whiteleaf leather flower. Bright pink bells with creamy yellow insides from late spring or early summer into fall on new growth, with fluffy golden seedheads; 10 to 15 feet tall. U.S. native. Zones 4 or 5 to 9. Clematis versicolor. Pale leather flower. Abundant purple-and-cream bells from late spring into midsummer on new growth, followed by showy seedheads; vining to about 8 feet. U.S. native. Zones 5 to 9. Clematis viorna. Vasevine. A “leather flower”-type clematis with thick-petaled, bell-shaped, purplish pink-and-yellow flowers through the summer months on new growth; climbs with tendrils to about 12 feet tall. U.S. native. Zones 4 to 9. Coix lacryma-jobi. Job’s tears. Dangling green flowers followed by large, bead-like seeds; strappy green leaves; 3 to 4 feet tall. Self-sows freely. Annual. Commelina communis f. aureostriata. Variegated Asiatic dayflower. Blue flowers in mid- to late summer, with white-striped leaves; about 1 foot tall but spreads wider. Self-sows freely and may produce all-green seedlings (remove these). Annual. Cornus florida. Eastern dogwood. Small, deciduous tree with white flowers in late spring; red fall color; usually 15 to 20 feet tall. U.S. native (provenance Milford Township, Bucks County, PA). Zones 5 to 9. Seeds have been cleaned and stored cool/moist since early October. Cosmos sulphureus. Sulphur cosmos. Bright orange flowers in summer and fall. This isn’t the compact type: it reaches 4 to 6 feet tall and is an excellent addition to perennial borders. Annual. Cryptotaenia japonica f. atropurpurea. Purple mitsuba, Japanese parsley. Grown for its deep purple foliage, which is particularly handsome in spring to early summer and edible too; the tiny pinkish flowers are not showy; 12 to 18 inches tall. Consider cutting plant to the ground in midsummer to discourage self-sowing, which can be abundant otherwise. Perennial; Zones 4 to 8. Cuphea ‘Firefly’. ‘Firefly’ cuphea. Bright red-and-purple flowers from early or midsummer into fall on 12- to 18-inch-tall plants. Self-sows. Annual. Cuphea viscosissima. Blue waxweed, clammy cuphea. Rich violet-purple flowers from early or midsummer into fall on 18- to 30-inch-tall stems. Pinching can encourage the plant to produce a more attractive, bushier form. Self-sows. U.S. native. Annual. Dahlia ex ‘Bishop of Llandaff’. Dahlia. Seed collected from red-flowered, dark-leaved ‘Bishop of Llandaff’, which reaches about 3 feet tall. Seedlings are likely to have dark foliage and bloom in a range of colors. Commercially, the seed strain usually goes by the name ‘Bishop’s Children’. Tender perennial. Datisca cannabina. False hemp. Small, greenish flowers in midsummer; pinnate leaves. Male plants remain upright, reaching 6 to 8 feet tall; females develop an arching habit as their seeds form. May self-sow (does here at Hayefield). Perennial; Zones 5 to 8. Daucus carota ‘Anatolian Black’. ‘Anatolian Black’ carrot. Long, tapering roots that are deep purple outside and cream-colored inside. Many of the plants flowered the first year; I pulled those out. One root overwintered and flowered the second year; these seeds are from that plant. I believe that the original seeds were from Turkey. Edible. Annual. Deschampsia cespitosa. Tufted hair grass. Clump-forming, cool-season grass with basal green leaves and taller stems (3 to 4 feet) carrying early-summer flowers that develop into a cloud of golden seedheads. The species is native to North America and parts of Eurasia. These seeds are from plants grown from seed from Mien Ruys’ garden in the Netherlands. Perennial; Zones 4 to 9. Dianthus carthusianorum. Carthusian pink, clusterhead pink. Clusters of pink flowers from early into late summer atop slender, 18-inch-tall stems. Perennial; Zones 5 to 9. Diervilla sessilifolia. Southern bush honeysuckle. Deciduous shrub with small yellow flowers from early or midsummer into late summer, followed by reddish seed capsules; showy orange-red fall color; 3 to 5 feet tall; U.S. native. Zones 5 to 8. Dioscorea batatas ‘Variegata’ (C. oppositifolia ‘Variegata’). Variegated cinnamon vine. Twining vine to about 6 feet tall with glossy, heart-shaped leaves that are speckled and streaked with white when young. Grows from edible tubers. These are bulbils, not seeds. Perennial; Zones 5 to 10. Elymus canadensis. Canada wild rye. Clump-forming, cool-season grass with arching, whiskery seedheads atop 4- to 5-foot-tall stems. U.S. native (provenance Milford Township, Bucks County, PA). Perennial; Zones 3 to 9. Elymus hystrix (Hystrix patula). Bottlebrush grass. Clump-forming, cool-season grass with brushy, silvery green, summer flower spikes that turn tan in fall; 3 to 5 feet tall. U.S. native (provenance Milford Township, Bucks County, PA). Perennial; Zones 3 to 8. Eragrostis spectabilis. Purple lovegrass. Clump-forming, cool-season grass that s clouds of purplish pink blooms in mid- or late summer into early fall; to around 18 inches tall. Self-sows freely: very pretty in a meadow-type planting but I wouldn’t recommend it for a border. U.S. native (provenance Milford Township, Bucks County, PA). Perennial; Zones 4 to 9. Eryngium yuccifolium. Rattlesnake master. Ball-shaped clusters of white flowers in mid- to late summer that develop into long-lasting seedheads over spiky, grayish green leaves; 4 to 5 feet tall. U.S. native. Perennial; Zones 3 to 8. Eucomis comosa ex dark-leaved types. Pineapple lily. Starry, cream-to-pink flowers in an elongated cluster in mid- to late summer, and strap-like leaves; to around 2 feet tall. Seed collected from purple-leaved ‘Oakhurst’ and ‘Sparkling Burgundy’; seedlings may have green or purple leaves and take several years to reach flowering size. Perennial (or tender perennial); Zones 6 or 7 to 10. Eupatorium hyssopifolium. Hyssop-leaved thoroughwort. Airy heads of white flowers from late summer into fall; very slender leaves; about 2 feet tall. U.S. native. Perennial; Zones 4 to 8. Euthamia graminifolia (Solidago graminifolia). Grass-leaved goldenrod, flat-top goldenrod. Narrow green leaves on slender stemmed topped with flattened clusters of bright yellow blooms in mid- to late summer; 3 to 4 feet tall; spreads by rhizomes. U.S. native (provenance Milford Township, Bucks County, PA). Perennial; Zones 3 to 9. Eutrochium dubium (Eupatorium dubium). Eastern Joe-Pye weed. Fluffy heads of pink flowers in mid- or late summer to early fall on 4- to 5-foot-tall stems. Self-sows. U.S. native. Perennial; Zones 3 to 9. Gillenia stipulata (Porteranthus stipulatus). American ipecac. Abundant, small, white flowers in early summer; lacy green leaves turn deep red in fall; 2 to 3 feet tall. U.S. native. Perennial; Zones 4 to 8. Glycine max ‘Cha Kura Kake’. ‘Cha Kura Kake’ soybean. Early-maturing plants that were 12 to 18 inches tall, with brown-and-beige seeds. Edible. Annual. Glycine max ‘Natsu Kura Kake’. ‘Natsu Kura Kake’ soybean. Early-maturing plants (but the latest of these three strains) to around 1 foot tall, with black-and-cream seeds. Edible. Annual. Glycine max ‘Ogemaw’. ‘Ogemaw’ soybean’. Early-maturing plants (12 to 18 inches tall) with reddish brown seeds. Edible. Annual. Gossypium ‘Red Beauty’. ‘Red Beauty’ cotton. Green leaves slightly tinged with red; pink-and-cream flowers and reddish bolls (pods) filled with white fibers; reached nearly 3 feet in a container. Annual. Gossypium herbaceum ‘Nigrum’ (or ‘Nigra’). Black-leaved cotton. Near-black leaves and hibiscus-like pink flowers, followed by near-black bolls (pods) filled with white fibers; reached about 30 inches in a container. Annual. Heliopsis helianthoides (variegated). Variegated oxeye. Green-and-white leaves, and bright yellow, daisy-form flowers in mid- to late summer, on 2-foot-tall plants. My stock started with one of the original ‘Loraine Sunshine’ plants; it has seeded around since then and produced variegated offspring, including the clump from which I collected these seeds. Perennial; Zones 3 to 9. Heptacodium miconioides. Seven-son flower. Deciduous small tree (to around 20 feet after 25 years) with white flowers in late summer; showy reddish pink calyces in fall; and attractive, peeling bark. I’m not sure about the viability of these seeds (I’ve found only a couple self-sown seedlings), but they could be worth a try. Zones 4 to 9. Hibiscus trionum. New Zealand hibiscus. Pale yellow flowers with dark centers through the summer into fall; to about 2 feet tall. Self-sows freely. Annual. Ilex verticillata. Winterberry. Deciduous shrub with small white flowers in summer and showy berries on female plants in fall and winter; 6 to 10 feet tall. These seeds were collected from a variety of species plants as well as cultivars with red, orange, and yellow berries. U.S. native. Zones 3 to 9. Seeds have been cleaned and stored warm/moist since mid-October. Impatiens balfourii. Balfour’s touch-me-not, poor-man’s orchid. Pink-and-white flowers from midsummer to frost on 2- to 3-foot-tall plants. Self-sows freely. Annual. Ipomoea batatas ex ‘Blackie’. Sweet potato vine. Seeds collected from ‘Blackie’, which has deeply lobed, deep purple leaves and light purple, morning glory-like flowers. Seedlings will be variable, but the few self-sown seedlings I’ve found over the years have had lobed leaves and bronzy or purple foliage. Tender perennial. Very few seeds. Iris domestica (Belamcanda chinensis). Blackberry lily. Spotted orange flowers in mid- to late summer, followed by clustered, round, black seeds, over fans of sword-like green leaves; usually around 3 feet but parent plant was 5 feet tall. Perennial; Zones 4 to 10. Juniperus virginiana. Eastern red cedar. Evergreen tree that can eventually reach around 40 feet tall. Female plants produce small blue “berries”. U.S. native (provenance Milford Township, Bucks County, PA). Zones 3 to 9. Seeds have been cleaned and stored cool/moist since mid-October. Lespedeza capitata. Round-headed bush clover. Rounded clusters of small, creamy white flowers in mid- to late summer; seedheads last through winter; 3 to 4 feet tall. U.S. native. Perennial; Zones 4 to 8. Liatris scariosa. Blazing star. Dense tufts of purplish flowers in spike-like heads in mid- to late summer; 3 to 4 feet tall. U.S native. Perennial; Zones 3 to 8. Liatris scariosa ex ‘Alba’. Blazing star. Same traits as above, but these seeds were collected from a white-flowered plant. U.S. native. Perennial; Zones 3 to 8. Linaria capraria (L. capraia). Toadflax. Small, needle-like, gray-green leaves and dainty lavender-pink flowers; to about 8 inches tall. Parent plants grown from seed from Italy. Perennial; not sure of range, but hardy here in Zone 6/7, at least. Lindera benzoin. Spicebush. Deciduous understory shrub with yellow flowers in early spring; yellow fall color; and bright red berries in autumn on female plants if a male is nearby; 6 to 12 feet tall. A host plant for spicebush swallowtail and eastern tiger butterfly larvae. U.S. native (provenance Milford Township, Bucks County, PA). Zones 4 to 9. Seeds have been cleaned and stored warm/moist for 4 weeks, then moved to cool/moist in late October. Lobelia cardinalis ex ‘New Moon Maroon’. Cardinal flower. Spikes of bright red flowers in late summer. These seeds were collected from ‘New Moon Maroon’, a selection with dark purple foliage; plants grew about 3 feet tall. Not sure what the seedlings will look like. Perennial; Zones 3 to 8. Lobelia siphilitica. Great blue lobelia. Spikes of blue flowers in mid- to late summer or early fall on 2- to 3-foot-tall plants. U.S. native. Self-sows. Perennial; Zones 3 or 4 to 9. Lunaria annua ‘Pennies in Bronze’. ‘Pennies in Bronze’ honesty, money plant. Similar to regular honesty, but with violet-purple flowers and purple-tinged seedpods. It wasn’t anywhere near as showy as it is in the photo from Annie’s Annuals, but it was nice, and it grew better for me than most honesty plants. Biennial; Zones 4 to 9. Lychnis coronaria. Rose campion. Basal rosettes of silver-hairy foliage, with upright, branching stems topped with single, magenta flowers; 2 to 3 feet tall. Self-sows. Perennial; Zone 3 to 9. Melissa officinalis ‘All Gold’. ‘All Gold’ lemon balm (also known as ‘Gold Leaf’). Expanding clumps of lemon-scented and -flavored foliage and tiny white flowers; 12 to 18 inches tall. ‘All Gold’ plants have yellow foliage through the growing season (especially bright in spring and early summer). Color comes true from seed; I have never found solid-green seedlings. Perennial; Zones 3 to 9. Mina lobata (Ipomoea lobata). Spanish flag, exotic love. Twining vine with lobed green leaves and one-sided sprays of tubular blooms that are coral-red in bud, maturing through orange to finish creamy yellow, from late summer to frost; climbs 6 to 9 feet tall (can get even higher on a large support). Annual. Molinia caerulea subsp. arundinacea. Purple moor grass. Clump-forming grass with lush basal foliage and leafless flowering stems; rich yellow fall color; 6 to 7 feet tall. Seeds collected from ‘Skyracer’. Perennial; Zones 5 to 9. Nigella damascena ‘Cramers’ Plum’. ‘Cramers’ Plum’ love-in-a-mist. White flowers in summer followed by reddish purple pods; 12 to 18 inches tall. Annual. Oenothera glazioviana (O. erythrosepala). Large-flowered evening primrose, magic primrose. Basal rosette of nondescript green foliage the first year (or two). When the plant is ready to bloom, the 3- to 4-foot-tall flowering stems produce pointed buds that unfurl quickly into fragrant, yellow flowers at dusk: an event to enjoy each evening through much of mid- and late summer. Usually biennial; Zones 4 to 9. Orlaya grandiflora. White lace flower. Lacy heads of white flowers in summer over ferny green leaves; usually about 2 feet tall. Self-sows. Annual. Panicum amarum. Bitter panic grass, coastal switch grass. Clump-forming, warm-season grass with grayish green foliage; flowering stems start out upright, to around 6 feet tall by late summer, and gradually lean outward as the arching, lacy sprays of seeds form in late summer into fall; yellowish fall color. U.S. native. Perennial; Zones 3 to 9. Panicum virgatum. Switch grass. Clump-forming, warm-season grass. These seeds were collected from species plants and garden selections, so height, habit, and leaf color will likely be variable. U.S. native. Perennial; Zones 3 to 9. Papaver ‘Lauren’s Grape’. ‘Lauren’s Grape’ poppy. Single, rich purple flowers in early summer on 2- to 3-foot-tall stems. Annual. Parthenium integrifolium. Wild quinine. White flowers from early or midsummer to late summer or early fall; 3 to 4 feet tall; colorful foliage in fall. U.S. native. Perennial; Zones 4 to 8. Patrinia scabiosifolia. Golden lace. Umbels of bright yellow flowers in late summer to early fall on 4- to 6-foot-tall stems; leaves turn shades of orange and red in fall. Perennial; Zones 4 to 9. Penstemon digitalis. Foxglove penstemon. White flowers in early summer; red to maroon fall foliage color; 2 to 4 feet tall. U.S. native (provenance Milford Township, Bucks County, PA). Perennial; Zones 3 to 8. Petunia exserta. Single red flowers for months; can reach 2 to 3 feet tall, with a weaving or trailing habit. Annual. Phaseolus lunatus ‘Alma’s PA Dutch Purple Burgundy’. ‘Alma’s PA Dutch Purple Burgundy’ lima bean. Heirloom variety; twining vines with green pods that produce deep reddish purple seeds. Annual. Phaseolus vulgaris ‘Yin Yang’. ‘Yin Yang’ bean. Bushy plants produce green pods that can be eaten fresh when young; better, though, to let them mature and produce their beautiful black-and-white seeds (useful as a dry bean). Annual. Phlomis tuberosa. Tuberous Jerusalem sage. Tiered whorls of pink flowers in early summer; dry into long-lasting seedheads; 4 to 5 feet tall. Perennial; Zones 4 or 5 to 10. Phuopsis stylosa. Crosswort. Small, domed clusters of pink flowers mostly in late spring to early summer, with scattered rebloom through the summer; foliage has a skunky odor; 6 to 8 inches tall. Perennial; Zones 5 to 9. Phytolacca americana ‘Sunny Side Up’. ‘Sunny Side Up’ pokeweed. Bushy, 4- to 6-foot-tall plants with white flowers followed by near-black berries; reddish pink stems. Self-sows, and comes partly true from seed; rogue out any all-green seedlings. Perennial; Zones 5 to 9. Phytolacca americana ‘Variegata’ (‘Silberstein’). Variegated pokeweed. Bushy, 3- to 5-foot-tall plants with white flowers that mature to near-black berries; reddish pink stems with cream-splashed foliage. Self-sows; seedlings are variegated but markings vary from plant to plant. Perennial; Zones 4 or 5 to 10. Plantago major ‘Atropurpurea’. Purple-leaved plantain. Grown for its broad, reddish purple leaves; also has thin spikes of insignificant, greenish flowers; 6 to 12 inches tall. Self-sows freely. Perennial; Zones 3 to 9. Platycodon grandiflora ‘Axminster Streaked’. Balloon flower. puffed-up buds open to purple-blue flowers speckled and streaked with variable amounts of white in mid- to late summer (some seedlings may be solid-colored); yellow-to-red fall color; 12 to 18 inches tall. Perennial; Zones 3 or 4 to 8. Polanisia dodecandra. Dwarf cleome, red clammyweed. Blooms through the summer with heads of white flowers that have long, reddish stamens; about 2 feet tall. U.S. native. Annual. Prunella vulgaris ‘Variegata’. Variegated self-heal or heal-all. Like the common (weed) form, this one has small heads of purplish flowers in summer, but its special feature is its cream-splashed foliage; markings are most noticeable in cool weather. Not a show-stopper, but fun if you like weird weeds. I’ve had it around for about 15 years (originally from Glasshouse Works, I think); doesn’t seem to be in the trade any more. Self-sows, and comes at least partly true; remove any all-green seedlings if they appear. Perennial; Zones 4 to 9. Ptelea trifoliata ‘Aurea’. Golden hop tree, golden wafer ash. Small deciduous tree with yellow-green flowers in summer; bright yellow leaves that are particularly eye-catching from late spring to early summer, then again in fall; 10 to 15 feet tall. Leaf color comes true from seed. Zones 4 to 9. Pycnanthemum tenuifolium. Narrow-leaved mountain mint. Clusters of tiny, white flowers through much of the summer; needle-like green leaves are intensely mint-scented; 2 to 3 feet tall. Seems to be a less vigorous spreader than many mountain mints. U.S. native (provenance Milford Township, Bucks County, PA). Perennial; Zones 4 to 8. Quercus macrocarpa. Bur (or burr) oak, mossycup oak. A white oak with lobed green leaves and large (almost golfball-sized!) acorns that have a fringed rim on their caps; yellowish fall color. Mine has grown about 10 feet in 15 years; can eventually reach to 70 feet or more. U.S. native. This is the first year mine has set acorns. They have been stored cool/moist since mid-October. Zones 3 to 9. Rosa achburensis. A little-known rose with single, white, lightly fragrant flowers in early summer, grayish green leaves in summer, and an abundance of orange-to-red hips in fall; to about 6 feet tall here. My original plant came from Don Hackenberry of Appalachian Wildflower Nursery, who introduced this species to cultivation in North America. Seeds have been cleaned and stored cool/moist since mid-October. Hardiness range unknown (is hardy here in Zone 6/7). Rosa glauca. Blue-leaved rose. Reddish new growth gradually turns purplish and finally blue-gray; single pink flowers in early summer, followed by abundant, rich red hips; 6 to 8 feet tall. Seeds have been cleaned and stored cool/moist since mid-October. Zones 2 to 9. Salvia pratensis ex ‘Madeline’. Meadow sage. Showy bloom spikes in late spring to early summer; 24 to 30 inches tall. Seed collected from purple-blue-and-white ‘Madeline’; seedlings may vary in color. Perennial; Zones 3 to 9. Salvia pratensis ex ‘Twilight Serenade’. Meadow sage. Showy bloom spikes in late spring to early summer; 24 to 30 inches tall. Seed collected from rich purple-blue ‘Twilight Serenade’; most seedlings should be that color, but some might be blue-and-white or pink. Perennial; Zones 3 to 9. Sanguisorba armena. Mounds of gorgeous blue foliage, with 3- to 4- foot-tall flowering stems that carry nodding clusters of tiny white flowers in midsummer. Perennial; not sure about hardiness, guessing 4 or 5 to 8. Sanguisorba tenuifolia ‘Alba’. White Japanese burnet. Nodding clusters of tiny white flowers in late summer atop 5- to 7-foot-tall stems; ferny green leaves turn yellow in fall. Perennial; Zones 4 to 8. Sanguisorba tenuifolia (ex pink). Japanese burnet. Seed collected from a pink-flowered plant growing next to ‘Alba’; similar except for color; not sure what color seedlings will be. Very few seeds. Sanguisorba tenuifolia ‘Purpurea’. Purple Japanese burnet. Reddish purple flower heads atop 5- to 7-foot-tall stems in late summer into fall; ferny green leaves turn yellow in fall. Perennial; Zones 4 to 8. Schizachyrium scoparium. Little bluestem. Warm-season, clump-forming grass with upright stems carrying silvery seed tufts in fall; coppery fall color; 2 to 3 feet tall. U.S. native (provenance Milford Township, Bucks County, PA). Perennial; Zones 3 to 9. Silene dioica ‘Ray’s Golden Campion’. ‘Ray’s Golden Campion’ red campion. Abundant, bright pink, single flowers in late spring atop 12- to 18-inch-tall stems. Most seedlings have bright yellow foliage; rogue out any all-green plants. Perennial; Zones 5 to 8. Silphium terebinthinaceum var. pinnatifidum. Cut-leaved prairie dock. Basal rosette of large, deeply lobed leaves; nearly leafless flowering stems carry yellow, daisy-form flowers in mid- through late summer; usually 4 to 6 feet here (can reach to 10 feet). U.S. native. Perennial; Zones 4 to 8. Smilacina racemosa (Maianthemum racemosum). Solomon’s plume. Arching stems carry green leaves; tipped with plumes of white flowers in late spring to early summer, followed by red berries; 2 to 3 feet tall. U.S. native (provenance Milford Township, Bucks County, PA). Seeds have been cleaned and stored cool/moist since early October. Perennial; Zones 3 to 8. Sorghastrum nutans. Indian grass. Clump-forming, warm-season grass with spiky, golden tan panicles in late summer; coppery seedheads in fall; orange-yellow fall color; 4 to 6 feet tall. U.S. native (provenance Milford Township, Bucks County, PA). Perennial; Zones 4 to 9. Spodiopogon sibiricus. Frost grass. Clump-forming, warm-season grass with airy panicles in late summer; leaves held horizontally; orange-yellow fall color; 5 to 6 feet tall. Perennial; Zones 4 or 5 to 8. Sporobolus heterolepis. Prairie dropseed. Warm-season, clump-forming grass with very narrow, arching foliage; airy panicles of cilantro-scented flowers in mid- to late summer, with showy seedheads in fall; golden orange fall color; 2 to 4 feet tall. U.S. native. Perennial; Zones 3 to 8. Staphylea trifoliata. American bladdernut. Deciduous understory shrub or tree with white flowers in mid- to late spring; pale yellow fall color; inflated seedpods in fall; 10 to 15 feet tall. U.S. native (provenance Milford Township, Bucks County, PA). Zones 3 to 8. Symphyotrichum laeve (Aster laevis). Smooth aster. Light purple-blue daisy-form flowers from late summer into fall; 3 to 5 feet tall. U.S. native. Perennial; Zones 4 to 8. Symphyotrichum novae-angliae (Aster novae-angliae). New England aster. Late summer into fall bloom on 4- to 5-foot stems. Seed collected from rich purple ‘Hella Lacy’; seedlings are likely to be shades of purple, but pinks are also possible. U.S. native. Perennial; Zones 3 to 8. Symphyotrichum oblongifolium (Aster oblongifolius). Aromatic aster. Densely branched stems typically 2 to 3 feet tall, with hundreds of lavender-blue to purple-blue flowers through much of the fall. U. S native. Perennial; Zones 4 to 9. Tanacetum parthenium ‘Aureum’. Golden feverfew. Clumps of aromatic, bright yellow, lacy leaves with upright, branching stems that carry small, white, daisy-form flowers from midsummer into fall if deadheaded; usually about 1 foot tall. Self-sows. Perennial; Zones 4 to 9. Tanacetum vulgare (yellow-leaved). Tansy. Deeply cut, aromatic leaves and clusters of yellow flowers from midsummer into fall; 3 to 4 feet tall. Seeds collected from ‘Isla Gold’; many seedlings will also have yellow foliage; rogue out all-green seedlings. Perennial; Zones 3 to 9. Tellima grandiflora. Fringecups. Lush clumps of heart-shaped green leaves; 1- to 2-foot-tall stems carry dainty white flowers that turn pink as they age, in late spring to early summer. U.S. native. May self-sow. Perennial; Zones 4 to 8. Thermopsis villosa (T. caroliniana). Carolina lupine, Carolina bushpea. Lupine-like spikes of yellow flowers atop 4- to 5-foot-tall stems in late spring or early summer, followed by interesting seedpods. U.S. native. Perennial; Zones 4 to 8. Tinantia erecta. Window’s tears. Pink flowers atop 2- to 3-foot tall stems from midsummer to frost. Self-sows. Annual (tender perennial in frost-free areas). Tridens flavus. Purpletop tridens. Clump-forming, warm-season meadow grass with airy, reddish brown to deep purple panicles in mid- to late summer; yellow fall color; 4 to 6 feet tall. U.S. native (provenance Milford Township, Bucks County, PA). Perennial; Zones 5 to 9. Tripsacum dactyloides. Eastern gama grass. Clump-forming, warm-season grass with broad leaf blades; slender, arching flower spikes mostly in mid- to late summer, maturing to large, cylindrical seeds; 5 to 8 feet tall; clumps are upright at first, eventually developing a sprawling habit as seeds develop. U.S. native. Perennial; Zones 4 to 9. Verbascum blattaria f. albiflora. White-flowered moth mullein. Basal rosette of toothed, glossy green leaves; 3- to 4-foot-tall spikes of white flowers with fuzzy purplish stamens, mostly in early to midsummer. Self-sows (some seedlings may be the usual yellow form). Biennial or short-lived perennial; Zones 5 to 9. Verbena bonariensis. Brazilian vervain, purpletop vervain. Dense clusters of lavender-purple flowers atop slender stems from early or midsummer to frost; 3 to 5 feet tall. Self-sows freely. Annual or tender perennial (Zones 6 or 7 to 10). Vernonia lettermannii. Narrow-leaved ironweed. Clustered, bright purple flowers in early fall; slender green leaves; 3 to 4 feet tall. Parent plants grown from seed collected from ‘Iron Butterfly’; they varied in height, amount of branching, leaf width, and resistance to rust. U.S. native. Perennial; Zones 4 to 9. Veronicastrum virginicum. Culver’s root. Slender, spiky clusters of white flowers in mid- or late summer; long-lasting seedheads; 5 to 7 feet tall. U.S. native. Perennial; Zones 3 to 8. Vitex negundo ‘Heterophylla’. Cut-leaved chaste tree. Deciduous shrub or small tree with deeply cut, palmately compound leaves and spiky clusters of light purple-blue from mid- or late summer into fall. Can reach 15 to 20 feet as a tree, but I cut it back to about 1 foot each spring; the resulting multi-stemmed shrub reaches about 6 feet and looks something like a giant Russian sage (Perovskia). Always loaded with bees. Self-sows. Zones 6 to 10. Zea mays ‘Otto File’ (red). Red ‘Otto File’, ‘Ottofile Rosso’, or red eight-file corn. Plant looks like an ordinary corn; cobs carry eight rows of large, smooth, deep red kernels; an old type of corn supposed to be excellent for polenta. Parent plants grown from seed from northern Italy. Annual. Zea mays ‘Pignoletto Giallo’. ‘Pignoletto Giallo’ flint corn. Plant looks like an ordinary corn; cobs of yellow, teardrop-shaped, pointed kernels. Another old variety used for polenta or flour. Parent plants grown from seed from northern Italy. Annual. Zea mays var. tunicata. Podcorn. Plant looks like an ordinary corn; short cobs with red or yellow kernels; each kernel usually enclosed in its own papery pod. Parent plants grown from seed from northern Italy. Mainly grown as an ornamental. Annual. List your requests — up to a dozen packets — using the full botanical name, in order of preference (with the ones you want the most closest to the top). Please, be specific: do not request “some of everything” (I know it may be tempting), “whatever is easiest to grow” (give the annuals or edibles a try), or “whatever is left” (judging by previous years’ giveaways, there won’t be much). I will do my best to send you everything you ask for, but as I don’t have unlimited quantities, I may not be able to fill all of your requests. If there is something you desperately want, please note that on your list. If there are many requests for a particular type of seed and I can’t make up enough packets for everyone, I will fill the requests in the order that I get them, so I encourage you to send me your list as soon as possible. For those of you interested in native plants, I did my best to include that information in the descriptions. It’s up to you to find out specifically where in the U.S. the plant is native, if that matters to you. 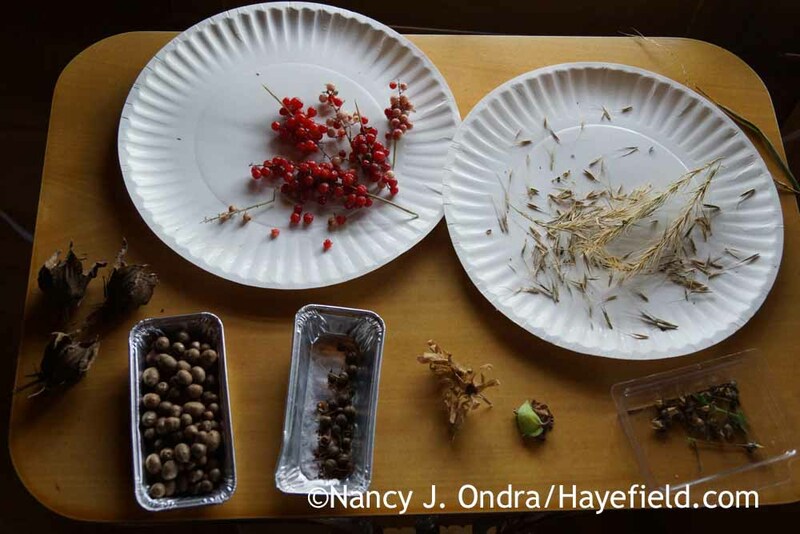 I included provenance information for all seeds that I collected from native populations of plants growing in the meadows, hedgerows, and woods at and around Hayefield (Milford Township, Bucks County, PA). I also noted some plants that are particularly likely to self-sow, based on personal experience. It’s your responsibility to check the potential invasive status of anything you are considering asking for. “Ex” in the plant name means that the seed was collected from a vegetatively propagated plant with that cultivar name, or from an unnamed plant with certain traits that may or may not not come true from seed. Because the resulting seedlings are likely to be variable, they aren’t the same as the cultivar, name-wise. For example, if you grow out seeds of Dahlia ex ‘Dracula’, you could refer to the new plants as “seedlings from ‘Dracula'”, but not just ‘Dracula’. There is no fee for these seeds, other than postage (see below), and I am not asking for any seeds in return. My goal in doing this is simply to get cool seeds into the hands of fellow gardeners who will sow, grow, and appreciate them. If you have luck with the seeds I send you, it would make me very happy if you’d be willing to collect seeds from the resulting plants and then pass them on your gardening friends or your favorite seed exchange. Quite a few of them are very hard to find or not commercially available at this time, so they need to be shared as widely as possible. I’d also greatly appreciate getting comments or emails about how the seeds worked out for you. Obviously, I’d like to hear that they did well, but it’s also very useful to know if you didn’t have luck with them, if the plants didn’t perform well for you, or if they turned out to be different from how I described them. I do my best to make sure that I collect the seeds from the right plants, clean them carefully, and label them properly, but mistakes are always possible. There’s also a possibility that the plants I collected from may have crossed with other species or selections growing here, so the offspring might be different than expected. I do need to ask for postage again this year. U.S. readers, please send me a SASE (self-addressed, stamped envelope – regular or business size). When I confirm your request, I’ll let you know how many stamps I think the SASE will need (maybe just one for a packet or two, but probably two or three if you’re requesting more than a few packets, or if you’re requesting bulky seeds, such as corn or beans). For readers outside of the U.S., I will pay for the shipping, but I will probably have to limit the total to three or four packets to keep the cost down. It’s up to you to make sure that you are legally allowed to receive the seeds you request. Leave your request list in a comment below, or send it to me in an email at nan at hayefield dot com. Make sure that you include a valid email address with your request, and your first and last name too. I will respond to your request by email to confirm that I received it and to give you the mailing address for the SASE (or to ask for your mailing address, in the case of requests outside of the U.S.). If you have not heard from me within a day or two, assume that I did not receive your request and send it in again. Please mail your SASE to me by December 4, 2015. I plan to send out all the seeds by mid-December, so you should have them by the end of December. Where can I find out how to germinate these seeds? I’ve already done any cleaning required for all of these seeds, and I’ve provided special storage (cool and moist or warm and moist) for some, as indicated in their descriptions above. Another option is to type the botanical name into your favorite search program along with “sow” or “germinate.” You should be able to get at least basic tips on when, where, and how to plant the seeds that way. Thanks, Jesse. I just sent you an email with the mailing info. Nan, I can barely contain my excitement I have been wanting your Celosia Spicata ‘Mega Punk’ since I first saw it in your photos. If I could also have some of your Silene Dioica ‘Ray’s Golden Campion’, I may just die of happiness! I’ll send an email with my list and email address. You’re very welcome, Debbie. I just sent you an email! this is such an impressive list and I bet everyone reading it is left excited and dreamingly thinking of the next growing season. I just sent you an email. Your garden really harbours some rare treasures. I look forward to every post. Thank you for sharing your garden with us! It’s great to hear from you again, Britta. Please check your email for my response. I am over excited! Thanks so very much for your generosity! Drooling over the offerings right now. Got your list, Shirley, and sent you the mailing info by return email. Thanks! Hi there, Pam! I will keep an eye out for your email. Have fun making your list. After drooling over your gardens all year, I can’t help but get excited at the prospect of being able to try to grow some of the beautiful plants for myself. I am ever so grateful for your help. I am going to list the seeds I would love to have, in the order of preference. Thank you again. Gotcha! Will send as much as I can. Check your email Inbox, Marge! Just sent you an email, Sherry! Your list is astounding this year, I was so proud of myself for saving a dozen things and you’re listing more than ten times that, plus packing individually and sending them out! The golden campion is a favorite. I’ve had great luck with your seeds but for some reason my plants won’t reseed and I couldn’t find anything viable on the one plant which made it this year, so thanks for offering it again. It took nearly all my willpower to not ask for the oaks. My garden is so small, yet they are so cool. I’m looking forward to seeing what others request. Everyone’s tastes and interests are so different! It’s really interesting to me too, Frank. I like to provide lots of variety so everyone can find something they’d like to try. I’ve sent you an email with the mailing info. You’re so sweet, Karen; thanks! I’ve sent you an email with the details for the SASE. How lovely of you to collect & share your wealth of seeds! And I’m in awe of your knowledge of all the ‘real’ names and the time it must take to collect/clean. I, too, collect & propagate seeds, but I am not as organized as you are! You’re very welcome, Ginny. It’s my pleasure, really. I’ve sent you an email with the mailing info. Just sent you an e-mail. Thank you so much for this offer. I love reading your blog, your garden is so appealing and beautiful. Thank you, Jean. I look forward to getting your list. Thank you so much for your generosity! I just emailed you my requests, just wanted to say a public thanks! Very kind, Gabriella! I got your email and sent you a response. Oh my goodness, what exciting choices! The time it must take you to create such a collection! And thank you for offering! It is my joy to do this, Shannon. I have your requests on my list and have sent you an email with the mailing information. Hoe, hoe, hoe! (Sorry; couldn’t resist.) Check your email for my proper response! Nan, Thanks so much for doing this again this year, and for putting together such an extensive list. I save seed from my own garden sometimes, and I know how much work it is. You’re most welcome. Just sent you an email with the mailing info. Sorry for the delay; it has been a crazy day here, as you can imagine! Just sent you an email, Gretchen; thanks! Thank you Nan. I’ve been looking forward to this since you named the date. Hi Amanda! Just sent you an email. Christmas has arrived early – or certainly much generous holiday-like spirit on your part, Nan. It will be a delight to choose some seeds! Have fun poring over the list, Patty! Hi Cathy! Yes, I really wish more nurseries would carry Veronicastrum virginicum; it’s such a good plant. In fact, I have it on my list of future post topics in the hopes of getting more people excited about it. I just sent you an email with the info about your SASE for the seeds. You’re very welcome, Karen. I just emailed you with the mailing info. Sorry it’s taken several hours to respond; it has been a crazy day! Just sent you an email with the SASE info, Ellen. What a great list and how nice of you to share! Hey, Rob. Good to hear from you. This is one of my favorite garden projects of all time! Very, very kind and generous of you to offer these seeds again. Thank you so much! I just sent you the mailing info, Diane. What a wonderful (and time consuming) offer. Thank you so much. Love the endless ideas and advice on your blog. Im a beginner with high hopes here. Longing for a beautiful property like yours! Thanks, Kate! I’ve just sent you the mailing info. I am interested in the following seeds: Dianthus carthusianorum, Lindera benzoin, Papaver ‘Lauren’s Grape’, and Tellima grandiflora. Just sent you an email with the SASE details, Dorothy. I want to extend my gratitude for such a wonderful act of kindness. This is such a wonderful thing for our gardeners and our planet. Thank you, Charlie. It’s a delight to see how much happiness can come from tiny things that would otherwise have blown away. I imagine there are alot of us who had our day made better upon receipt of your post. I have sent an email with my choices. Thank you so much for your generosity. I will gladly pass along seeds this coming year to pay it forward. It’s been a very exciting day for me too, Deb. I got your list and have sent you an email with the mailing details. Thanks for sharing your wonderful efforts! Hi Cindi! I’ve sent you an email with the SASE details. Phaseolus vulgaris ‘Duchesse de Chambord’. I will be (force) growing these for a garden at next years Chelsea Flower show 2016. I have a stand in the Discovery zone that will be highlighting the UN Year of the Pulse and thought that it would be a fitting place for the seed from your garden to make it to Chelsea. I hope no one else is hesitant to ask for seeds just because they haven’t commented before; it’s not at all a requirement! I would be very pleased to have the seeds appear in such a venue. I have sent you an email to ask for your mailing address. I so appreciate all your time spent doing this. I, also, give my seeds and extra plants to other gardeners, and help pollinators at the same time. Just sent you an email, Cora. Just sent you an email to confirm, Susan. Hah. Mine has taken a lot of training and still fusses on occasion. I’ve sent you an email with the SASE info. I’ve just sent you an email, Lynn. Thanks for the seed offer, Nan, I sent you an email. Got it! Look for my return message in your inbox. Just sent you an email to confirm, Karen. I’m always amazed by the breadth of your seed offerings, Nan, and I can only imagine the work that goes into the effort. Thank you for your generosity! I’ve got a working list going but I’m debating an order (with myself) as I’m buried by a major lawn removal project and seed-starting may not be a realistic task to add to what’s already a long “to do” list this year. If I decide to request seeds, I’ll send an e-mail to you prior to your deadline (and knowing that a delay limits the likelihood of availability). Best wishes with the order-filling process! Hi Kris! At the rate the requests are coming in, I may need to end the giveaway before the 30th. But if there’s something you’d really like, please don’t hesitate to ask. Best of luck with your projects! Thanks, Shady! It’s been such a long and lovely fall here that it’s hard to believe winter will be here soon. Lots of work to do before then! Hello Nan, I am getting back into gardening so I thought I would.list the veggies first. Got your request, Rick; thanks. Check your email! Of all the white plants, the regular white liatris has never interested me – i find it to b a very dirty shade of white, which i hate. This liatris is so much brighter. Thanks, Jeffrey; just sent you an email with the SASE info. You’re most welcome, Pat. I just sent you an email. Thank you so much for your generosity…love your blog! Got your list and just sent you the mailing info, Deb. Hah – then I could show Mom pictures of her grandseedlings! Please check your email for the SASE info, Sally. Hey, Matt. Just sent you an email. Just sent you an email, Sandy; thanks. Thanks for the list, Sandy. I just sent you an email to confirm. Gardeners are such sharing people. Thank you in advance for your generous offer. Thanks, Cheryl; I just sent you the mailing info by email. This is my first seed request. Thanks for your generosity. A double welcome to you, Gary! I just sent you an email with the SASE info. Thank you Nan! You are amazing! I don’t know how you do it all and stay so pleasant ;) I don’t have any seed cleaning skills but I could include Ageratina altissima (snakeroot), Pseudognaphalium obtusifolium (rabbit tobacco) and a tall bushy salidago that I can’t identify with my SASE. Thank you for your generosity! 7. Symphyotrichum oblongifolium (Aster oblongifolius). You are the first person to request the Amsonia rigida, Kimberly–good for you! It is a very pretty plant. It’s kind of you to offer seeds in exchange, but not necessary. I just sent you an email with the SASE info. Thank you so much for offering these seeds- I love the pictures of your gardens- and am alway inspired by your beautiful color combinations! Here is my list–I’m so excited! 10. Sanguisorba tenuifolia compact plant.. Thanks, Sarah! Check your email for the mailing info. I’ve starred the items I’m most interested in. I’d take however much of the Corydalis you could spare (and would happily pay for it), as I’ve never encountered a Corydalis I didn’t like. Hi there, Klaus. I just now (Friday, 8pm) sent you an email about your requests. If you don’t receive it, please leave me a note here. Thanks! ?i am so excited! Thanks so much for this very generous offer. This is my first time participating in the seed. Here is the list. Thanks, Linda; you have the mailing info now. Thank you so much for your generosity. Happy Thanksgiving! You too, Lisa! Just sent you an email about the SASE. Hi Alice. I’ve sent you an email with the SASE information. Hi, Thanks so much for your generosity. I’ve wanted to try these seeds for a long time and the time is right. I just sent you an email with the mailing information, Susan. Thank you so much. I just received the seeds. How exciting!! Thanks again for sharing. Hope everyone enjoys a good gardening year. Thanks for letting me know they made it, Mary. Shall we just give winter a miss and skip directly to spring so we can get growing again?